Villa Analaya is a private villa located on the west coast of the beautiful island of Phuket. 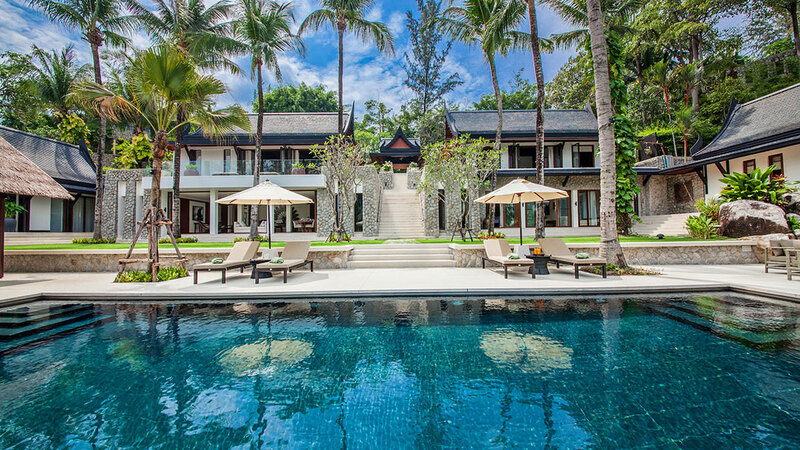 Set within the exclusive Laemson Estate on Phuket’s most enviable location, the Millionaire’s Mile, it’s true luxury at its core. The villa is perched on a headland, with 5 individual pavilions housing the property’s massive 6 bedrooms, all equipped with immaculate furnishings, ensuite bathrooms with bathtubs, and large glass doors and windows that frame breathtaking ocean views. Facing the Andaman Sea, you’ve got endless views of the blue sky and crystal, blue waters of the famous Phuket coast. The villa pays homage to traditional Thai architectural details with a dominant contemporary aesthetic. Large, open spaces welcome bright natural light, and the use of floor-to-ceiling glass sliding doors on the living areas and bedrooms allow guests to have an open-air experience welcoming the cool breeze that the lush forest that surrounds brings. The villa’s highlight is definitely its beautiful zero-edge infinity pool. Facing the Andaman Sea and embraced by palm trees and other tropical trees, swimming at the pool will make you feel like you’re smack in the middle of nature. Around the pool are plenty of sun loungers, a comfortable outdoor sala, as well as an alfresco dining area. Manicured, tropical gardens surround the pool area, where a large trampoline is placed for both kids and adults to have fun with. Inside the villa, you can find plenty of lounge spaces, with large comfortable seating, and expansive spaces that definitely create a relaxing and indulgent atmosphere. Other facilities that you can find at Villa Analaya include a fully equipped gym with pool, garden, and ocean views; a fully equipped gourmet kitchen; a library; a TV room; and a yoga deck. For activities outside the villa, Patong is just a short drive south from the estate. When you’re done spoiling yourself at Villa Analaya, nightlife, dining, and shopping are yours to enjoy at this famous Phuket spot. Services at the villa include a villa manager, who makes sure everything is in place and going smoothly during your stay at the property; daily housekeepers so everything remains clean and beautiful at the villa; as well as a private chef, whom you can ask to prepare special banquets, dinners on the beach, as well as all-day snacks as you enjoy your time with your friends and/or family. Another reason why Villa Analaya is a true luxury escape is its private, white sand beach. With crystal clear shallow waters, it’s a beautiful spot to swim with your kids, or simply passing by the time reading a good book as you sunbathe under the warm Phuket sun. Kayaks are also available for you to use if you want to explore the waters right in front of the private villa. Villa Analaya was meant to provide endless indulgences, absolute luxury, and unmatched exclusivity so you can enjoy your very own private paradise. Thank you to Aob & Nok and the Team. We had a wonderful holiday in Villa Analaya. The food, atmosphere and beds were exceptional. Thank you so much for the magical week we had a wonderful time and really never want to leave. Thank you to all the wonderful staff who looked after us for 8 days. We had a wonderful time with friends and family and hope to come back again in the future. We have never felt so relaxed and enjoyed every moment. The care you give us was magic. Thank you so much. Thank you very much for the amazing hospitality! We had a wonderful stay with family and friends at Villa Analaya. The villa is secluded and quiet, perfect for a relaxing private retreat with the beach in front that we enjoyed so much. The staff are the best and very professional and well trained. We appreciate their service so much especially Kay, she worked overtime to take care of all of us. We wish to come back in the near future.